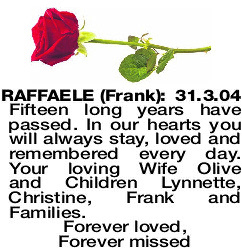 RAFFAELE (FRANK) 31.3.04 Fifteen long years have passed. In our hearts you will always stay, loved and remembered every day. Your loving Wife Olive and Children Lynnette, Christine, Frank and Families.